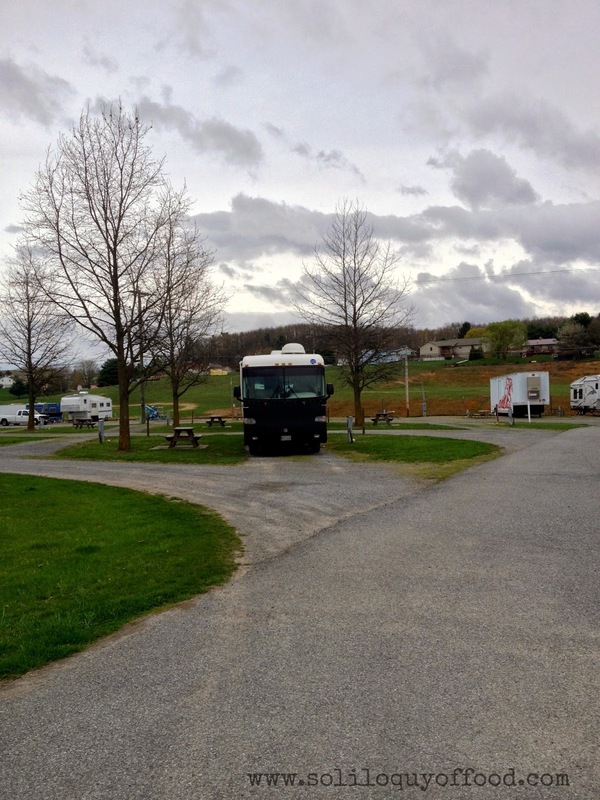 Our route lead us straight through Roanoke, VA - where we happened upon Fort Chiswell RV Park. It was right off the highway, easy in and easy out. We didn't have a reservation but being so early in the season we were pretty confident we could get a site. Although we are fully contained and can go for 4-5 days without needing to fill up on water, being able to plug in to charge all devices and grind coffee for the morning is a huge plus. We paid about $30.00 for our site, a full hookup, pull through, large rig friendly site. LET THE COFFEE GRINDING BEGIN! This park was so peaceful, quiet, and just lovely! I did have a problem hooking onto the wifi at first, but then later that night got on and was happy. 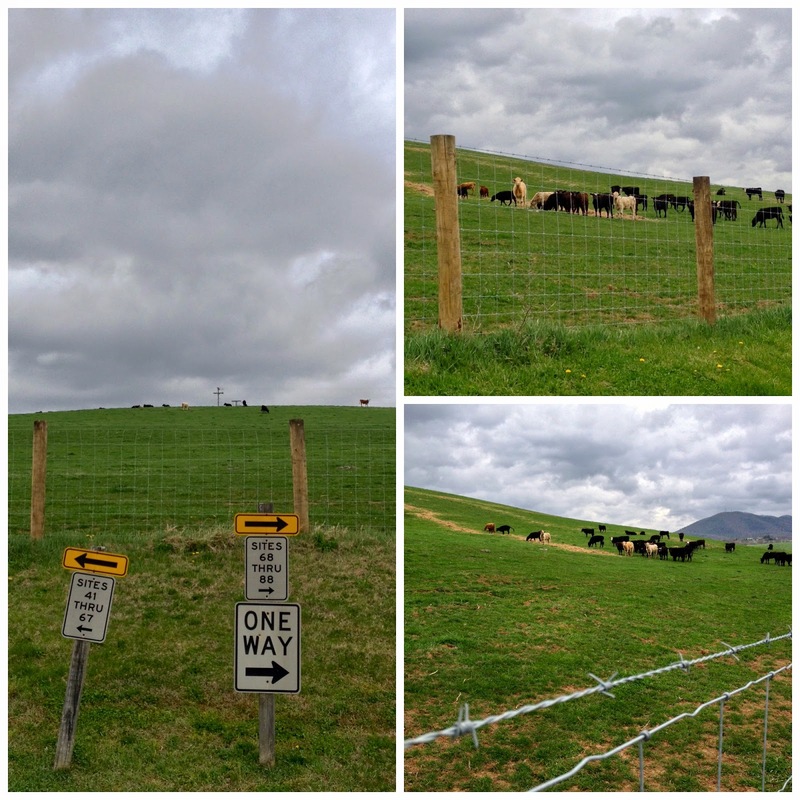 We listened to the cows in the neighboring fields and just enjoyed our surroundings.....then streamed a few episodes of The Americans. Come to find out, this was our last enjoyable walk with Notch. 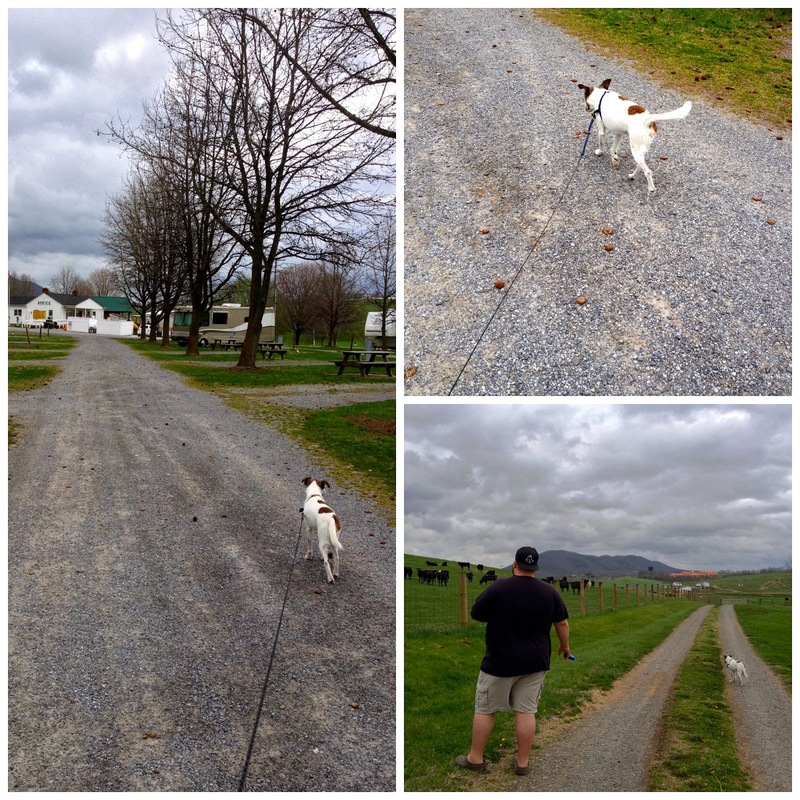 As you can see in these pics he was super excited and interested in sniffing each and every tree, and inspecting the grounds...and the cows. We slept in, we were running behind, but still took an extra half hour or so to take a walk around. I'm now glad that we did. 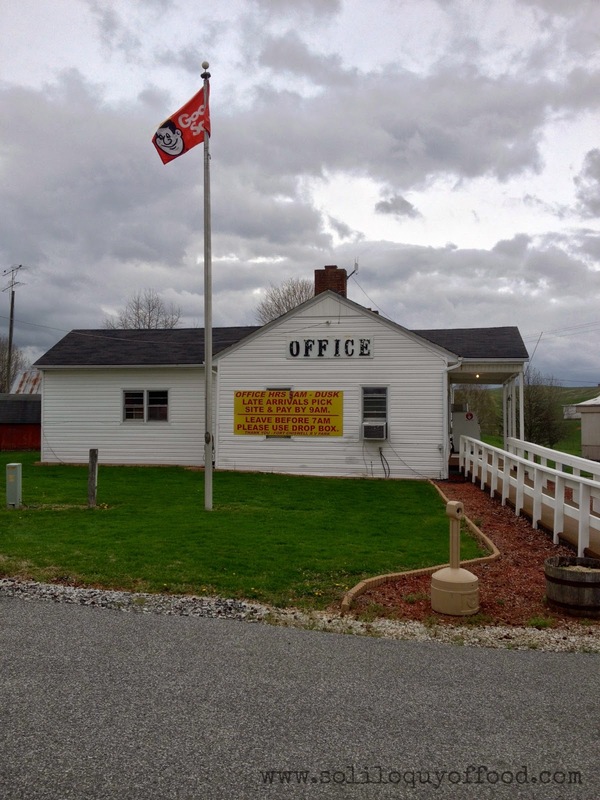 Fort Chiswell is a place I enjoyed and would return to again. It's your basic nuts and bolts campground; they have all the basic amenities located in the green rolling hills of VA.
Our next stop was Pigeon Forge, TN. We didn't plan on going this far south, but there was a cold front moving in, and we were trying to avoid snow. 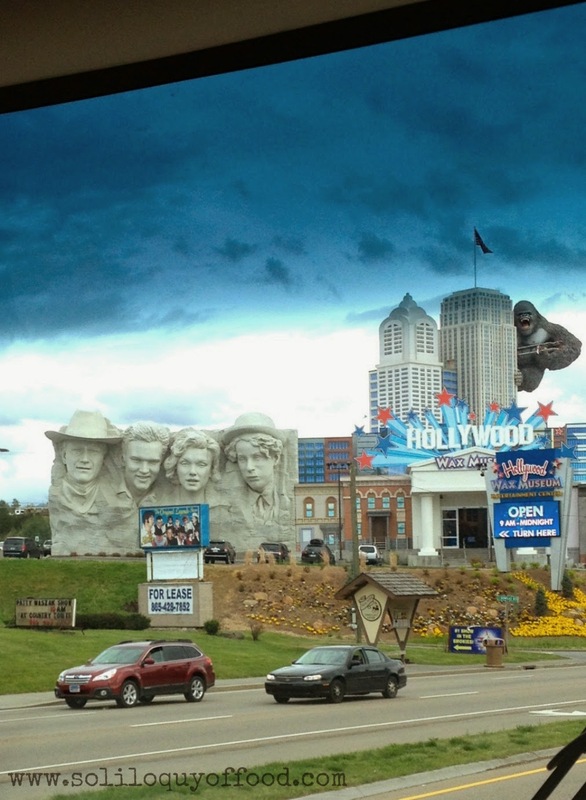 Pigeon Forge is close to the entrance to the Smoky Mountains; we were excited about getting to see the area....we just didn't anticipate how built up and kitschy it was! The above pic was taken through the windshield as we drove down the main drag. The main drag is clustered with attractions such as this, including Dollywood, The Hatfield's & McCoys Dinner Theatre....and the areas own Titanic ship (iceberg and water fountain included). Maybe I read one too many hippie magazines about the Smoky Mountains? 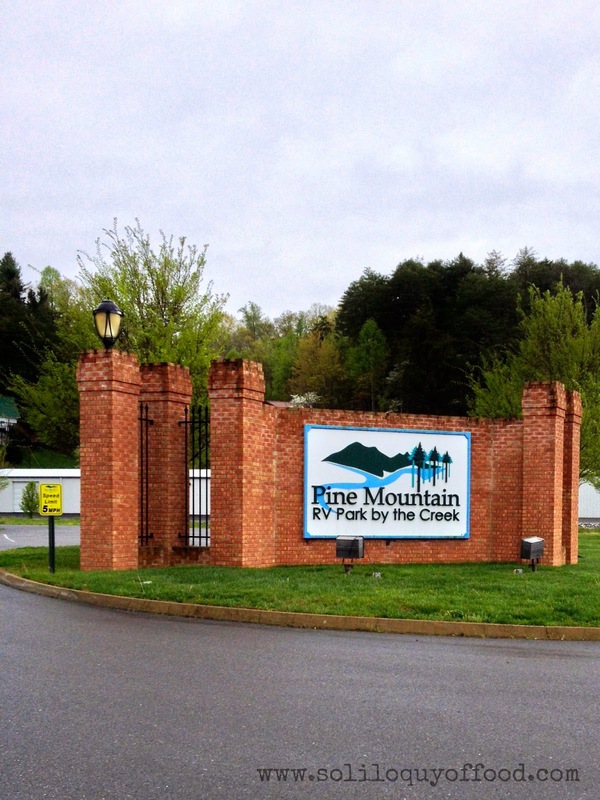 Nonetheless, we found Pine Mountain RV Park, a park that was on the trolley route. This was a way for us to get out and see the area without having to drive our 40' coach through traffic. 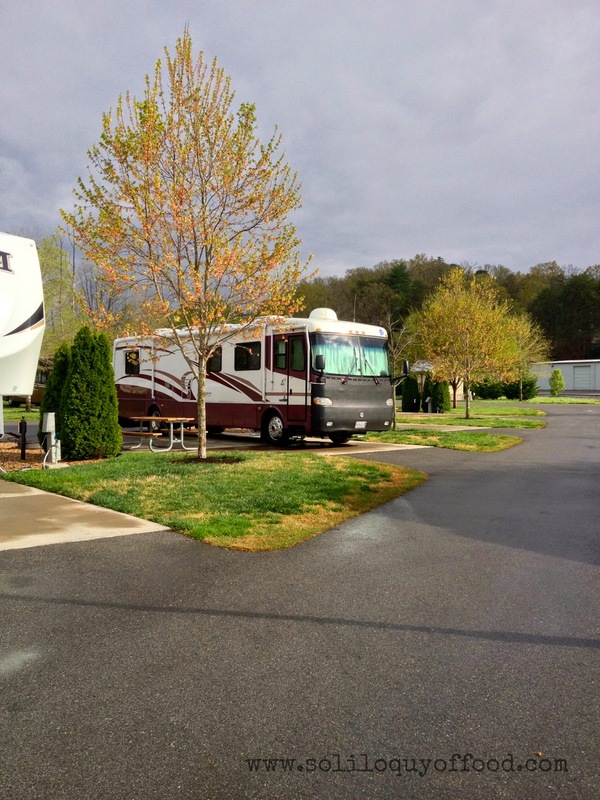 We paid about $43.00 for a site - again: full hook up, pull through, large rig accessible - they also offer level concrete pads here to park on and their sites have a nice design, some backing to the creek. Again, being off season we pulled in and acquired a spot for the night without a reservation. So we parked Marve (that's what we named our coach), settled Notch, Duke & Big Bird for the day, then took the trolley one town over to Gatlinburg (actually, it was 4 trolleys...but who's counting). Oh, and we didn't really avoid the cold front all that well....it snowed this day....even this far south! But that's okay, because it's always shinin' in the holler!! 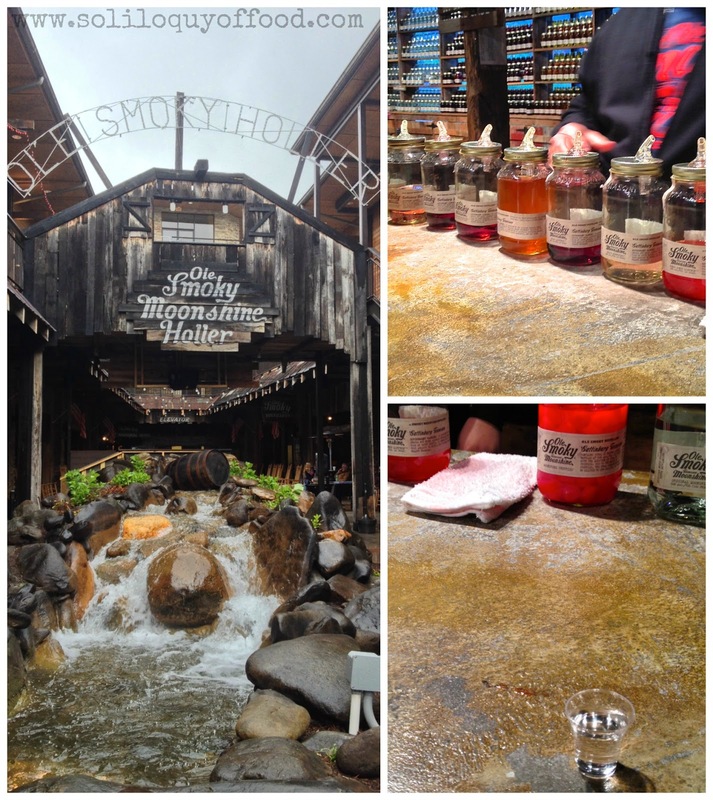 When in the hills of TN sip some shine! 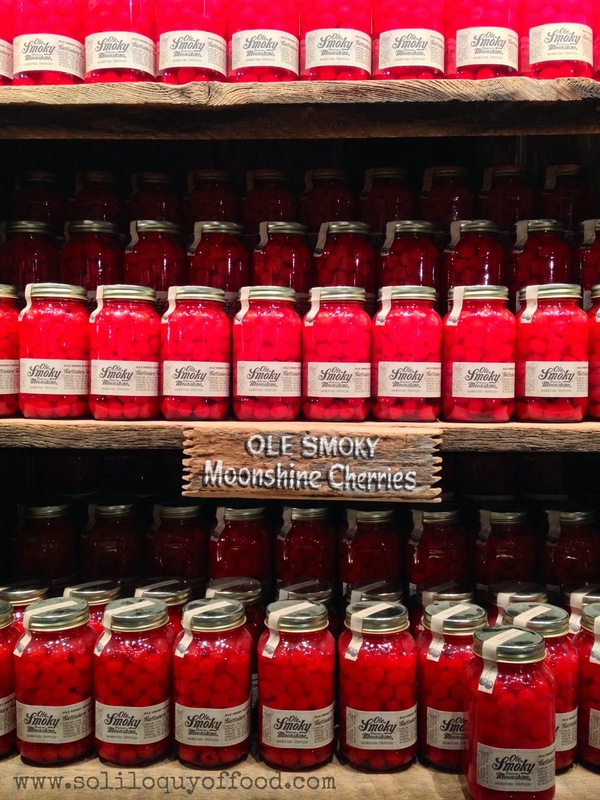 Ole Smoky Moonshine is just one of the moonshine distilleries in the area, I think the first one to legally produce and dispense moonshine. They offer live bluegrass music AND a generous tasting bar. We tried them all. They too, have added booze to jarred cherries.....and you thought I was crazy! 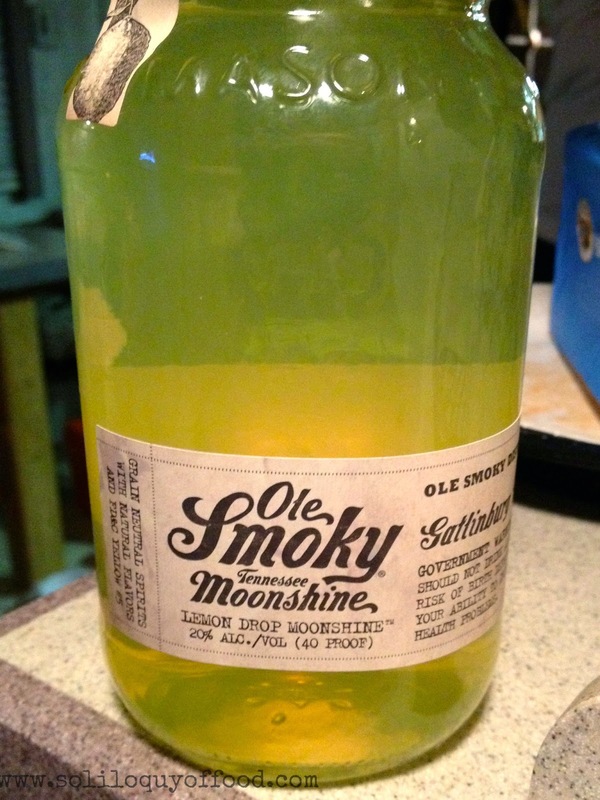 Their "White Lightnin" is distilled 4 times; it is odorless, and tasteless, and oh, so smooth! The "Original" is distilled only twice, it's like drinking a 2x4. Some other flavors we tried include Apple Pie, Blackberry, Lemon Drop, Peach, Strawberry, Charred, and Pineapple...and a Punch flavored one....I can't recall them all 100%, but they were all delicious! Lemon Drop way my pick. This is the only picture I have of it. Needless to say it wasn't around long....that snowy day we spent in TN....we drank the whole dang jar. 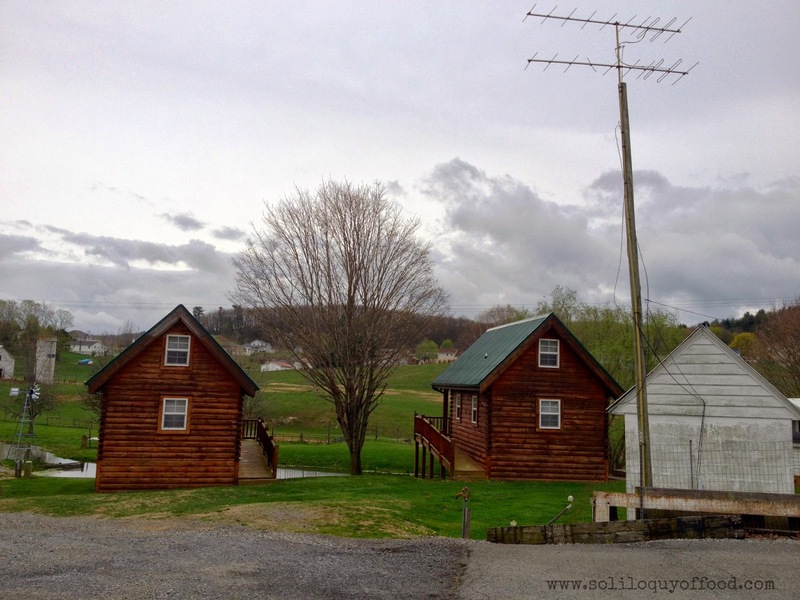 These were my 2 favorite campgrounds in the lower 48. Two very different places, two very different atmospheres; both comfortable, friendly, and accommodating. If you're in the vicinity, check them out....the shine, too! !